Many experts rely on folklore instead of data. It’s easy to see why. Folklore is widely available. It sounds good, and besides, it takes a lot of work to find reliable data. CNBC is one place where experts gather folklore. The business network provides a platform for many experts to share ideas. This means many experts just repeat what they heard someone else say in an earlier interview. Since the network doesn’t require experts to prove their opinions are accurate, folklore becomes widely accepted. One of the more popular opinions is that stocks are overbought. An analyst says the word “overbought” and smiles at the camera almost every day. The problem is that few experts tell us what overbought means. Technically, the term overbought means prices went up too fast. When they say overbought, analysts picture stocks as a rubber band stretched too far. Overstretched is the same as overbought. Now, release the rubber band and it quickly snaps back to normal size. With stocks, the assumption is after becoming overstretched, prices snap back to lower levels as they decline. The rubber band does sound like a good way to think about the markets. But it’s not a useful way. A better way views a rapid price rise as a rocket. It takes tremendous power for a rocket to break the hold of gravity. The strength we see in the initial stage of the rocket’s journey powers it to new highs. Now we have a testable question: Are stocks like a rubber band or a rocket? Well, data shows that the stock market is more like a rocket than a rubber band. Overbought markets usually keep going up. This is bullish for the current stock market. 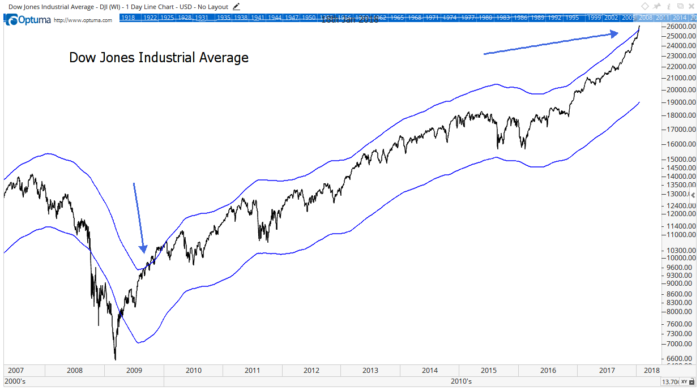 Recently, the Dow Jones Industrial Average was 15% above its 200-day moving average (MA). Analysts call this overbought. The chart below shows this also happened in early 2009. In 2009, the Dow was accelerating after a devastating bear market. This is the first time the Dow accelerated this fast in more than seven years. With more data, we learn this is far from just the second time we’ve ever seen this. Since 1900, the Dow moved this far from its 200-day MA more than 150 times. This market action was common in the first part of the 20th century but has been rare in the past 60 years. These signals are generally bullish. On average, the Dow delivers better than average performance with lower than average risk in the months after the signal. The table below summarizes results in different time periods. Data confirms overbought markets are strong markets. Now is the time to expect more gains and to invest aggressively. Editor’s Note: Renowned natural resource expert Matt Badiali wants to give everyone who watches his special webinar the chance to turn $5,000 into $500,000. In fact, he just completed a report on not one … not two … but three junior resource companies that are poised to soar 10,000% or more. However, to learn Matt’s new, proprietary strategy that finds these kinds of life-changing opportunities, you must sign up for the webinar by tonight, January 24, at midnight EST. To sign up, click here now.